Injuries and age related decline led to a 76 win season for the Reds in 2014. FanGraphs is projecting a repeat for Cincinnati. Entering the offseason, four of five starting pitchers were in their final season with the Reds. In an attempt to mitigate risk, GM Walt Jocketty traded Alfredo Simon and Mat Latos for controllable talent. Those moves thinned the rotation, but should pay long-term dividends. The rotation is top heavy, and there are legitimate concerns with the lineup. This feels like a high variance team. Veterans like Johnny Cueto, Joey Votto, and Jay Bruce are all capable of posting excellent seasons. If it all clicks, the Reds can contend in the NL Central. Injuries, regression, and age-related decline may lead to another disappointing season. Everybody wants to know what to expect from Cueto. Can he repeat his Cy Young quality season? Is he injury prone? How does he repeatedly manage low BABIPs? Why did his strikeout rate increase? These are the biggest questions surrounding his game. He's being selected as the ninth pitcher in NFBC leagues. There isn't much room for upside at that price, although he could still be well worth it. Cueto's 2014 season included 20 wins, 243.2 innings, a 2.25 ERA, 0.96 WHIP, 8.94 K/9, and 2.40 BB/9. Fantasy owners are worried about his career high innings total. The last time he eclipsed 200 innings (2012), he followed up with a 60 inning campaign. His strikeout rate was the highest of his career by a wide margin. He induces weak contact as evidenced by a .238 BABIP against over his last 300 innings. A six pitch repertoire allows him to keep hitters off balance. Bailey was the Reds' top pitcher entering 2014, but a mixture of poor results and injury has cheapened his acquisition cost. He's expected to miss a few weeks to start the season as he continues to recover from September forearm surgery. You may recall his terrible April, which included a 6.15 ERA and an opponent triple slash of .345/.393/.602. He settled down after the first month. As a slightly homer prone pitcher, it would be nice to see him escape Great American Ballpark. Acquired as part of the Latos trade, DeSclafani is coming off a shaky debut for the Marlins. Still rookie eligible, he's a command and control type. He has a solid four pitch mix with a fastball, sinker, change, and slider. While none of the pitches performed well last year, his offspeed stuff has considerable promise. His fastball runs around 93 mph. He's being drafted around pitchers like Jeff Locke, Vidal Nuno, and Jeremy Guthrie. He's not a fantasy stud, but he has a much higher ceiling than the Guthrie's of the world. The Reds have announced that Jason Marquis will open the season in the rotation. 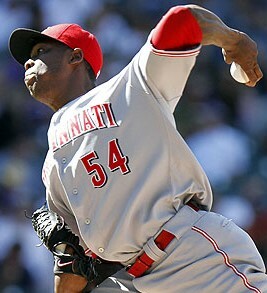 However, the development of Raisel Iglesias is of more interest to us. While many teams view the Cuban as a reliever, the Reds think he has the components of a starter. They bet $27 million on that evaluation. His fastball runs around 93 mph, and he has a good slider and curve. Look for a midseason promotion. How much really needs to be said about Chapman. He's coming off a season in which he struck out 106 of 202 batters faced. His fastball averaged over 100 mph. His slider and changeup were unhittable. He's the top closer in the game, and you'll have to pay the price if you want him on your fantasy roster. If he's unable to pitch, the Reds have a few options. As mentioned, many scouts view Iglesias as a high leverage reliever. He could slot in if Chapman's arm explodes. Other alternatives include Tony Cingrani, Sam LeCure, Michael Lorenzen, and Jumbo Diaz. They aren't pitchers you would normally roster without a ninth inning role. The 2014 season included breakouts from Todd Frazier and Devin Mesoraco. Those were more than offset by injuries and decline from Brandon Phillips. If the offense fires on all cylinders, it could pace the league. The downside is another season with fewer than 600 runs scored. Mesoraco suffered a concussion earlier this spring. Catchers and concussions are a terrible combination. Blows to the head are common for the position which increases the risk of re-injury. He's blocked at first base by Votto, so the club will have to hope he makes a full recovery. He's the third catcher off the board according to NFBC. After a 25 home run season with strong peripherals, I was ready for a full endorsement of that cost. Alas, I now prefer Evan Gattis, Yan Gomes, and even Brian McCann. Much of the Reds struggles to score can be attributed to Billy Hamilton. The job of the leadoff man is to avoid making outs. That results in more runs and plate appearances for everyone. After hitting just .250/.292/.355, the club plan to give him another go atop the lineup. When he reaches base, he's excellent lineup protection. Votto and friends can sit on fastballs, knowing the opposition is focused on preventing stolen bases. He's a high contact hitter. I expect modest improvement this season – perhaps something like a .265/.305/.370 line. His high steal totals have his ADP sandwiched between Corey Dickerson and Carlos Gonzalez (18th among outfielders). Bruce hit just .217/.281/.373 last season. Since he produced at an average or better rate in four categories, he still had positive value in most fantasy formats. We know what his floor looks like. Now that he's healthy again, we should see another streaky 30 home run season with plenty of RBI. He stole a career high 12 bases in 2014. The club seemingly encourages aggression on the base paths, so he might repeat the speed numbers. He's being selected 27th among outfielders - near players like Matt Holliday and Kole Calhoun. That strikes me as a fair price. The linchpin of the offence is Votto. He reminds me of Edgar Martinez as a high contact hitter who draws walks and hits for power. He has a long injury history, but his advanced approach at the plate ensures a high floor when healthy. The NFBC crowd is sharp – they're selecting him as the 11th first baseman. Even then, he has plenty of upside. The only downside is injury risk. The Reds are 23rd in our power rankings. They are one of the highest variance clubs in baseball. They have the raw components of a 90 win team, but they could just as easily fail to win 70 games. The NL Central is a competitive landscape, so they'll need an unusually healthy season to contend. Most of their best players have intimate familiarity with the disabled list, so health might be too much to ask. Cueto, Votto, and Chapman are among the best in their respective fields. That can be an excellent foundation for success.